Every great change starts with an individual willing to take the first step. 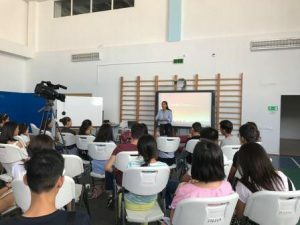 The Academy took place in Aktau, Kazakhstan in the style of a summer camp from August 7-13 and again from August 14-20 for 50 students from the cities of Aktau and Atyrau. The main focus of the academy was to broaden teenager’s mindsets and inspire them not only to build academic skills, but also to develop personal skills in order for them to find out what they truly want to do. 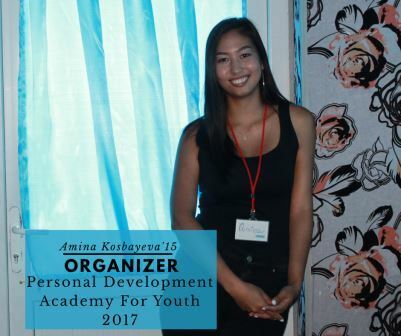 Amina shares two outstanding moments from the academy, which offered participants skills trainings in leadership, public speaking, networking, and personal development. ‘Both of these events were a great way for participants to see the value in striving to develop personally in various aspects of your life. The events were a visit from the American student volunteers from EXPO 2017 and the U.S. Embassy representative and the professional orientation workshop. Through these events, the participants learned and were shown how talented they are and that this whole world is full of opportunities that are just waiting for them to take action. I aspired to make the participants realize that they are the future of Kazakhstan and that personal development is the first step on the way of becoming an important member of society’ shares Amina. 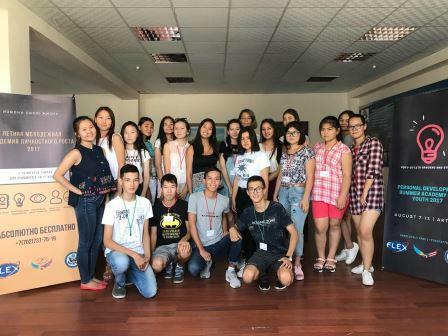 Throughout the Personal Development Summer Academy, speakers from across Kazakhstan shared useful tips and stories on how to use leadership and public speaking skills to better communicate with different people and just make new friends. Among numerous young leader speakers were Alimbek Tenisbayev, a successful socially active student from AlmaUniversity, who spoke about networking skills and Nurislam Ibrayev, a local activist and organizer of TEDx talks in Aktau, who held interactive sessions about how teamwork makes dreams work and how to inspire yourself and a team. Alongside this, a team of debaters from Almaty KIMEP University organized sessions based on their own respective experiences with finding a passion for what they do. 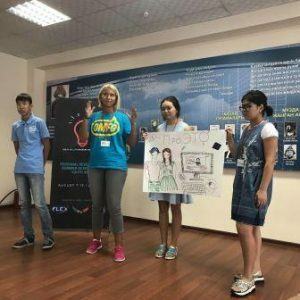 All of the speakers were young emerging leaders of Kazakhstan, which showed the high school and university students participating in the event that even at a young age a person is capable of doing magnificent things. In addition to the core Personal Development Academy sessions, participants took part in the Summer Ecological School organized by ECO Mangystau Organization, where they learned about ecological problems of the western region of Kazakhstan and brainstormed ideas of solving the problems. Together with the U.S. student ambassadors and U.S. Embassy in Astana representatives, the academy participants discussed the EXPO 2017 topic of the Future Energy. They also analyzed the proposal of the U.S. pavilion about the eternal energy and determining its value to people’s everyday life. Amina was the key organizer of the event. 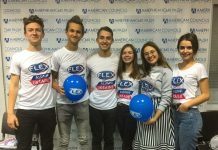 Her fellow FLEX Alumni Madina Urazayeva ’16, Ademi Sadyk ’16, and Marisa Berdikhanova ’17 volunteered at the opening and closing ceremonies. Written by FLEX Alumni Coordinator in Northern Kazakhstan Aknur Berdigulova ’14.